Subaru, long absent from the hybrid scene showcases the diesel plug-in hybrid VIZIV. Find out what this diesel electric Suby means for you. Subaru is an incredible carmaker. Smaller than most, it enjoys a fearsome and loyal following. Subaru cars are tough, not the best for fuel efficiency but buy a Subaru and you are set for the next 250,000 miles or more. If Subaru has worked out the kinks with its flat four boxer engine, it’s integral four wheel drive platform making it one of the best and toughest performance cars, it needed to work on energy efficiency. Everyone Has A Hybrid. Except Subaru! Ever wonder why so many carmakers have some sort of hybrid, yet Subaru has never offered us a hybrid. Sure there was the oddity of its two electric cars founding homes in Central Park, NYC and Japan, but no hybrids made it to the market. 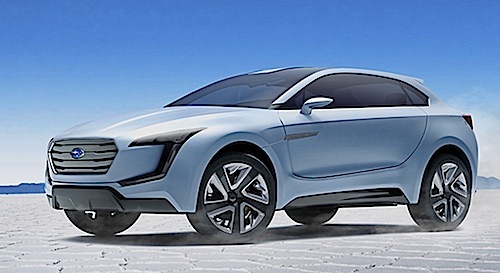 So is Subaru’s diesel plug-in hybrid (PHEV) for real or just showing what the company can do? Subaru Fights For Market Share. If you’ve noticed Subaru’s path over the past decades, it slowly and diligently made its cars tougher, more reliable and eventually what they are now. At this stage of the game when everyone screams fuel efficiency, no serious carmaker can afford not to have one. Subaru is finally showing what it can do with no less than a diesel plug-in hybrid. The questions still remains, what does the VIZIV (“Vision for Innovation”) hybrid crossover concept at the Geneva Motor Show mean? Technically Speaking. Using the company’s 2.0-liter typical Subaru Boxer design but this time in a diesel version mated to the high-torque-compatible Lineartronic continuously variable transmission (CVT), the Viziv uses only a single front electric motor that provides both propulsion and energy regeneration. It shoves in the rear two independent motors, which means technically the Subaru is still a 4x4 but this time with only 100% motor-driven rear wheels. This eliminates Subaru’s heavier AWD (all wheel Drive) platform, does away with the propeller shaft and more transmissions. The independent electric rear motors and the front platform gives the Subaru even more fine-tuned control over its four wheels and handling. Where Is Subaru Going With This? One thing seems obvious, despite its insistence on CVT transmission, the company seems to show where it is heading with its VIZIV Concept. We can determine future Subaru cars will all ride on its independent-rear-motor-driven symmetrical AWD system. We can’t expect the Viziv to come out as is, but we can expect to see its rolling platform make its way into its upcoming cars. While the question still remains whether or not a carmaker can make an affordable diesel plug-in hybrid, Subaru’s VIZIV is a showcase of what Subaru is working on and will give us tomorrow.